Last week we had rainbow cake and cupcakes to celebrate my daughter's birthday. This week we are welcoming the mid-autumn festival with rainbow snowskin mooncakes. Actually, I was not planning to make any snowskin mooncake this year since I have already done a few batches of Shanghai mooncakes for the past two weeks. However, this afternoon I was in the mood to 'play' in the kitchen and decided to attempt some rainbow snowskin mooncakes. 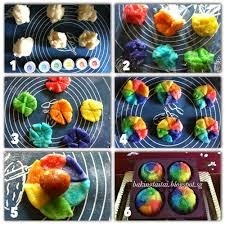 Sometime ago, I saw someone in a baking group who has done this rainbow mooncakes before and got the idea from her. The rainbow colours continue to cheer us up especially this mama here who is getting the jitters as PSLE draws nearer...haha! 1. Mix the kou fien and icing sugar together. 2. Add in the olive oil and water, mix well. 5. Cover the dough and rest for 15 minutes. 6. Divide the dough to the size require. 10. Put into the mooncake mould and press it firm. 12. Keep in the fridge for consumption later.